This is one of those days when numerous items must be covered before getting to the main topic; as frankly, I haven’t seen this many “horrible headlines” since joining Miles Franklin two-and-a-half years ago. Just how dire is the global situation, you ask? Well, put it this way; the fact that all-out war appears inevitable in one of the most politically and economically sensitive geographic hotspots – i.e., the Crimean Peninsula – is not even one of my top three priorities this morning. For the record, we continue to have a healthy fear that a new “cold war” could dramatically accelerate the inevitable demise of the global fiat currency regime; and to that end, can only pray it doesn’t devolve into a “hot” war. Unfortunately, history is not on our side; as economic – and empire – collapses have essentially always yielded major wars. In last week’s article “This is Why We Do What We Do,” we discussed this very topic – and consequently, why one would be crazy not to at least modestly protect one’s assets with precious metals. But again, we can’t emphasize enough that the system’s demise was set in stone decades ago – four, to be specific, from the second the gold standard was abandoned; and thus, “black swans” like Ukraine are immaterial in the big economic picture. If anything, such unrest is a symptom of out-of-control money printing, rather than the cause. That said, there were several news items this morning validating prior Miles Franklin Blog posts, starting with the incredibly ridiculous statements released by the Bank of Japan, following a regularly scheduled meeting in which it voted to continue with its suicidal “Abenomics” scheme. In the article “Do You Really Believe They Know What They’re Doing?,” we discussed how clueless central bankers truly are; and thus, their only “credibility” is in the propaganda of the bankers that own them; the politicians that partner with them; and bought-and-paid-for MSM cheerleaders. In actuality, Central bankers’ track record is one of historic, inexorable failure, incorporating one defining characteristic – the creation of economy-killing inflation. And no bank has failed more than the BOJ, which has made Japan the world’s most expensive nation to live in, and put it on the verge of a calamity that could invalidate several decades, if not centuries, of economic progress. Anyhow, whilst maintaining its – now year-old – plan to double the nation’s money supply in two years, the BOJ claimed that “Japanese exports have leveled off more or less.” Yes, after yesterday it was disclosed that the Japanese trade balance imploded to an ALL-TIME low! Next up, they claimed a “pickup in Japanese capital expenditures has become increasingly evident.” Huh???? For the past two quarters, Japanese capex plans have been reduced; and given the recent plunge in economic activity – much less, next month’s draconian increase in the national sales tax – how could anyone in their right mind even joke about capex improvement? And finally, their most moronic statement; i.e., “Japan’s economy is recovering moderately.” There’s that buzzword again – recovery – used universally by TPTB to whitewash the economic collapse they have created. Again, it was announced yesterday that the initial estimate of Japanese 4Q GDP growth of a measly 0.25% was reduced to just 0.15%; and don’t forget, the Japanese government utilizes a negative GDP deflator to make such calculations. In other words, even their massaged numbers show no growth – with the prospect of a horrific tax scheduled to take effect in three weeks’ time. Yet, they still claim Japan’s economy is recovering! I’ll take the “under” on that scenario; and thus, for those that want to bet the BOJ can levitate the Nikkei through further hyperinflation, we say but one thing – sold to you. …the S&P 500 now trades at 16 times its component companies’ earnings for the past year. That is double its level of five years ago, and almost identical to the level at which stocks topped out at the beginning of the decline in October 2007. Moreover, Nobel Prize winner Robert Shiller puts the S&P at 25 times average earnings, far above the historical average of 15.5. And thus, we again ask, isn’t it worth protecting just a little of your financial assets with precious metals? After all, the entire global economy is dramatically slowing; and thus, the result can only be a catastrophic financial crash or hyperinflationary Central bank support. …the big question everyone has is what happened to all those people that lost their emergency employment benefits? History shows that they usually drop out of the work force. We haven’t seen that yet, I still we’re going to see that throughout the balance of the year. And thus, the BLS’s “Hobson’s Choice”; as if they correctly delete these people from the Labor Force, the so-called “unemployment rate” could plunge to 4% – and perhaps, 2%-3% if the other 3.6 million scheduled to have their unemployment benefits expire this year can’t find new jobs either. Conversely, if they don’t delete them, the entire world will understand – as clear as day – that the BLS is fudging its data; ironically, to produce higher unemployment rates! And last but not least – that is, until today’s primary topic is broached – we couldn’t avoid discussing the planned IPO of a creepy company called Virtu; i.e., a High Frequency Trading platform that has only lost money once in the last 1,248 trading days. In other words, it must be operating either illegally or unethically; as once upon a time – as in, throughout 5,000 years of human existence – the world’s most successful traders were right 51% of the time. In today’s 100% corrupted markets, both TBTF banks – including those that proved how clueless they were just five years ago – and “HFT” firms, many owned by such banks – are all of a sudden always profitable. I mean, give me a break already! And the SEC is actually allowing such firms to go public? This is why we advise you to – as Jim Sinclair would say – GOTS, or “get out of the system,” and into the only assets such criminality cannot infiltrate; i.e., fully paid, PHYSICAL gold and silver coins and bars. Basically, the below chart tells you all you need to know money printing – which produces NOTHING but inflation; social unrest; draconian political decrees; and of course, more debt. Not to mention, accelerated economic weakness – which in turn, catalyzes more money printing. Since global Central banks went about “saving the world” in 2008, they have overtly created $8 trillion of currency out of thin air – let alone, covert printing such as the $16 trillion of “secret loans” we now know the Fed disseminated in 2008-10, and “off balance sheet” schemes such as the Fed’s “swap agreement” with dying European banks, allowing them to “borrow” as much money from the Fed as required. However, as such transactions are classified as “swaps” rather than “loans,” they are not required by IMF/BIS regulations to be considered newly printed money. And what has been the impact on real GDP growth? Absolutely ZERO; and more accurately, a net negative, given the aforementioned data massaging by lying governmental data agencies. Which again, is why you must protect your net worth with the only assets that, throughout 5,000 years of human history, have preserved purchasing power – and then some – in the face of Central bank tyranny. Speaking of such manipulation, there really is no way to properly purport just how blatant it has become; and consequently, how cataclysmic it will be when the current “Cartel” is permanently broken. 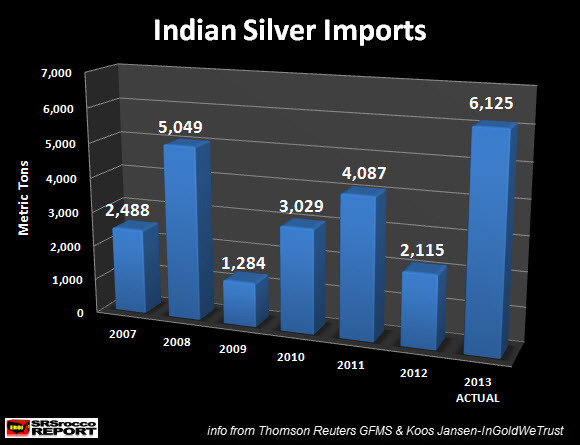 Yesterday, I read of how true Indian silver demand last year not only broke the previous high level – set in 2008, when global shortages were the norm – but utterly shattered it. And yet, we’re to believe the “free markets” pushed silver down to multi-year lows, amidst exploding global QE programs? Heck, in last week’s “Silver Anniversary,” we wrote of how this year, silver Eagle sales have been so strong – on pace to shatter last year’s record levels – that the U.S. Mint has been rationing sales to just 1.1 to 1.2 million per week. In 25 years of business, we have NEVER seen rationing like this during a “non-crisis period”; and thus, it is utterly astonishing how the Cartel has managed to keep PAPER prices down so low – even as most miners are on the verge of bankruptcy because their respective costs of production are so much higher. Just yesterday, the Mint sold an incredible 736,000 Silver Eagles – i.e, two-thirds of their weekly ration – and yet, we’re to believe that at EXACTLY the 10:00 AM EST close of global PHYSICAL markets, prices suddenly fell back to the same “line in the sand” at $21/oz – which just happens to be silver’s 200 DMA – that has been blatantly defended for weeks? As we wrote in last Fall’s “Irrefutable PM Manipulation Statistics,” PAPER silver experienced a 2+% intraday decline on 54% of all trading days last year; while this year – in which silver is up 8% – this percentage has increased above 60%! And oh yeah, today’s “news” was the total breakdown of U.S./Russian diplomacy regarding the Ukraine; a lower than expected NFIB small business sentiment index; and – at 10:00 AM EST, when global PHYSICAL markets close – a lower than expected JOLTS job opening survey, and the second biggest wholesale sales collapse in U.S. history; which frankly, is even more ominous than even the worst such decline, in 2008, given record U.S. automobile inventories. And how did the markets react to this news? First, take a look at yesterday’s prototypical action; in which gold fought through attacks at 2:15 AM and the 8:20 AM COMEX open, only to be stopped at the good old “cap of last resort” at 12:00 PM EST – at what do you know, the round number of $1,340/oz that has served as the Cartel’s “line in the sand” for several weeks now. Conversely, global stocks were lower until magically, the “Dow Jones Propaganda Average” was saved by a typical POMO-led rally at 10:00 AM EST, just as it reached the “PPT limit down level” of -100 points. Today, amidst the aforementioned, wildly PM-positive, stock negative news, yet again the Dow was magically buoyed by “DEAD RINGER” algorithms at exactly 10:00 AM EST – i.e., when the wholesale sales data emerged; whilst gold was capped simultaneously, pushing it below the key round number of $1,350/oz whilst silver was taken down nearly 2%, from $21.40 back to the aforementioned “line in the sand” at $21/oz. One simply couldn’t make this stuff up; and inevitably, the forces of evil WILL lose. Moreover, at these prices, well below the cost of production, it would be nearly impossible for a material decline to occur, in our view. This morning, a reader asked me how precious metals could afford inflation protection, when they have not been allowed to do so for the past two years. In response, I simply noted that they have done so for thousands of years; and the fact that for the past two, TPTB have attempted to “kick the can” with unprecedented precious metal suppression simply means the ultimate move higher will more than compensate for the recent frustration. Since the commencement of the precious metal bull in 2000, gold and silver have dramatically outperformed inflation; and when all is said in done, they will – as always – be the last assets standing. how can silver protect you when for 2 years it’s been down? two years is just the pause that refreshes. I’ve been in silver since Feb ’02 at $4.40 spot and it took 18 months just to break thru and hold $5. the recent two years don’t matter much in the big picture. PMs have protected against inflation for thousands of years; including since the dollar peaked in 2000, when silver was below $3/oz. They are currently being illegally suppressed – as the fiat regime moves toward its terminal stage – and thus, have been held down for two years. When the Cartel is broken – as all such attempts to suppress real money have – you will see what “inflation protection” truly means. Again, thank you so much for the daily updates. These are very valuable to me and I am sure very valuable to many others as well. An individual would have to have an extremely low IQ not to see that the whole system is rigged! But when mother nature slaps the sh!t out of the riggers you are most correct that gold and silver will be the last man standing. Unfortunately most of the middle class will slide in to the poor class and never understand why, but please keep trying as I’m hoping you are reaching some of them.